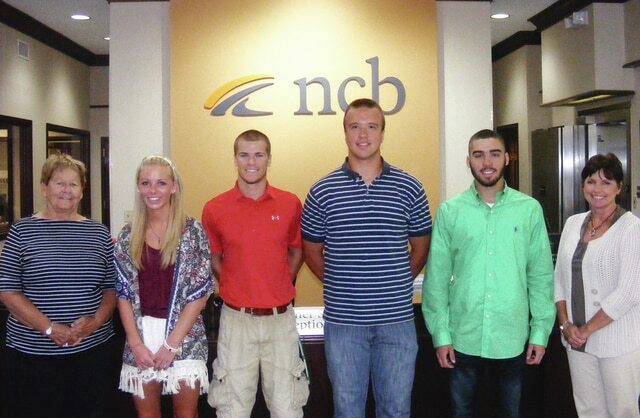 NCB announced the 2015 winners of the Ernie B. Blankenship Athletic Scholarship. Each student will receive $1,250 toward their tuition this fall. Pictured are: Rita Blankenship, Erin Hagan, a graduate of Hillsboro High School, Clyde Snow, a graduate of East Clinton High School, Jordan Wilt, a graduate of Lynchburg-Clay High School, Tanner Fowler, a graduate of Fayetteville-Perry High School and Deb Jones, NCB Ohio Co-President.